The changes the custom jewelry industry have undergone in the past years are nothing short of amazing. Valeria Fine Jewelry has not only followed these trends, we are proud to have set a lot of the current trends you are seeing today! Our success is based on our simple tenets of customer service. Tenets like offering only the highest quality merchandise at fair prices have helped us grow into what we are today. With that in mind, we are proud to show you some of our favorite Name Necklaces. Do you have a nickname, catchphrase, or trademark logo? We can take any of those things and turn them into custom Name Necklaces than you can’t find anywhere else. And usually at a lower or equivalent cost for better quality. Name Necklaces are a specialty of ours and it definitely shows. Our team is highly skilled in manufacturing jewelry and we are ready to start creating your custom name necklaces today! At Valeria Fine Jewelry, we will make the creation of your custom name necklaces as easy as possible. We’ll turn any image or concept into a stunning piece of custom jewelry and usually for less than you might think. Custom rings, bracelets, and pendants are all started with your contacting us with your idea and end with you loving your decision to do so. We guarantee you will be happy with the final piece because you will have the final approval on the design before your Name Necklaces are cast. Try getting that kind of service from an Asian manufacturer on Ebay, much less a sooth and hassle free return! This YF pendant had a row of channel set diamonds along the brush stokes of the letters. We drew this by hand and is a great example of the custom words or letters we can create. You will never be unhappy with the quality of Name Necklaces from Valeria Fine Jewelry. Every team member who works on your piece — designers, artists, bench jewelers, casters — will all handle your treasure with the maximum skill, care, and mastery. Valeria Fine Jewelry is the apex of high-quality custom jewelry, exemplary service and fair prices you will not find anywhere else. We pride ourselves on the service, quality, and value we provide everyone, no matter what their budget. This custom Name Necklace is an example of a customer’s intensely personal idea produced at a reasonable price. Our secret is the appropriate use of gold; it is thick where it needs to be and thinner where it can be. The diamond in this pendant are bead set and bright cut, adding sparkle to the diamonds. Here is another custom name pendant that we added a heart and some wings to. Send us your idea and we will make it happen! Many times, these custom Name Necklaces can be material intensive due to the size of them, especially if you want stones in them. Not only do out expert designers do an excellent job of using the correct amount of metal in our custom Name Necklace, but they maximize the stone size for the available space to insure a good look, but also the lowest carat weight possible. We can also provide more economical stone options than diamonds for your Name Necklaces like moissanite, white sapphire, and CZ. Although not the nicest of words, it doesn’t bother us! We will make anything you want that is possible. And legal. 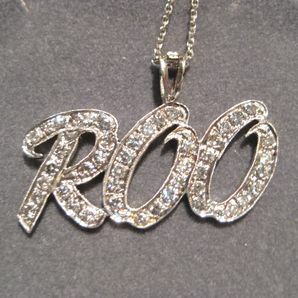 Start the production on your custom name necklaces with us, with only the limitations of casting and durability. Looking for a way to memorialize your family name? There tons of way we can help you do so. Just contact us to get this started! These stone choices can significantly reduce the cost of Name Necklaces versus using diamonds without sacrificing any sparkle. And in most cases, non one will ever know the difference. At Valeria Fine Jewelry, we specialize in Name Necklaces. From custom rings to custom pendants to bracelets and more. This shorty smooth pendant was started with a customer’s idea and was brought to life by our master in-house designer. This pendant was actually cast in 2 piece because it was so large and then soldered together. As you can see from the variety of the images on this page, Valeria Fine Jewelry has the skill and expertise to turn any idea into a stunning custom gold pendant you will be more than proud to wear. We had a huge Tool fan who wanted a necklace. So we took one of their stickers and turned it into a pendant. We have done something similar for others rock groups. We know that you can find Name Necklaces online for less. But these Necklaces will come from Asian sweatshops and hardly have the quality you would expect. You will also be limited to a few fonts. Asian Name Necklaces are thin, flimsy, and won’t last. If you want something durable, go with US made Name Necklaces. You will never be disappointed by the quality of a custom Name Necklace from Valeria Fine Jewelry. You deserve only the best and the chance to be at the center of attention because of your custom name necklace. We are the epitome of high-quality jewelry, outstanding customer service and prices you will not find anywhere else. Be sure to visit our PENDANT PAGE to see more of our custom pendants. Click HERE to learn more about custom jewelry, browse our portfolio, or contact us about Name Necklaces. Let us design your dream! !